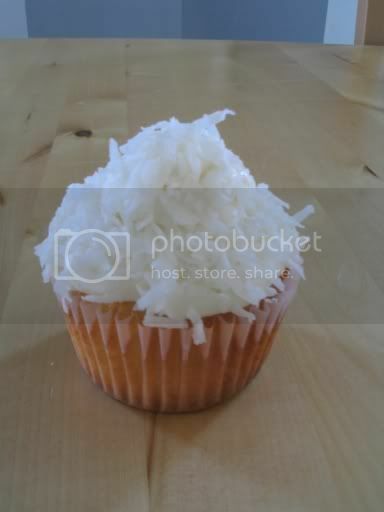 Cupcake, my love: Whose up for some Not-So-Fried Ice Cream? Whose up for some Not-So-Fried Ice Cream? Ok so here in New Mexico we have this dessert (which comes from Mexico) that is called Fried Ice Cream. I have to say that this dessert is one of my all time favorites. A ball of ice cream is encased in a bread crumb/corn flakish topping and deep fried until golden brown, and then is served in a crispy cinnamon tortilla shell with whipped cream and a cherry on top. (It is ok to drool, no one has to know) So seeing as how it's summer and all, I have had an outrageous craving for ice cream, so I wanted to make Fried Ice Cream, but try to do it in a way that wasn't going to be so detrimental to my waistline :0)---Yeah, yeah when you want Fried Ice Cream you shouldn't even be worried about your waistline, until I saw this figure friendly version of my most favorite Mexican Dessert. 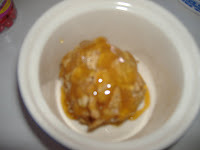 The recipe is from the Betty Crocker website and it's called Cinnamon "Fried" Ice Cream. 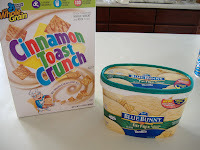 The reason why it's "Fried" in quotation marks is because the ice cream gets the same taste/texture as the original by using Cinnamon Toast Crunch!! I was thinking the same thing, these people at Betty Crocker are very clever!! Ok so you take the Cinnamon Toast Crunch, pour it in a bowl and crush it up with your hands, not to fine, because you still want some chunks. 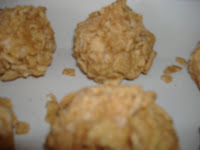 Then take you're vanilla ice cream balls (which I made even more healthy by using the Blue Bunny Fat Free with Splenda brand) and roll it into the cereal, making sure to smoosh the cereal into your ice cream ball. Place the finished ice cream in a jelly roll pan, cover and freeze for about 2 hours. Take 'em out and place then in the broiler for about 1 minute, just enough to give a little color to the cereal, but careful that the ice cream doesn't melt. And that's it!!!! Now top it anyway you like and eat-up!! 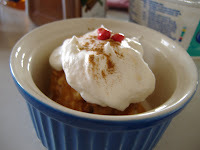 I topped mine with Cool-whip Free, caramel sauce, honey and cinnamon! I promise you that if you've ever had the original you won't be able to notice a difference! This recipe was so good and so satisfying! The ice cream was firm, but smooth and the cereal on it gave it this crunchy bite, but it was the drizzle of honey that totally made the dish!! I was trying to slowly enjoy each succulent bite I was putting into my mouth, but after the first bite I couldn't take it anymore...my sundae was devoured within seconds! 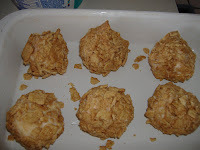 And if you've never had the original this will definitely become a favorite of yours, but I've also given you the one good reason to come visit New Mexico, because while this recipe is super yummy, you still have to try the traditional fried ice cream!! Hope you all enjoy a classic taste from the southwest! I used to go to Chi Chi's for friend ice cream all the time and loved it. I have never tried it at home. I must do so now. This looks awesome! I thought living in the Arizona desert it was impossible to do anything with ice cream! I am definitely going to try this! This is so cool! I love fried ice cream!